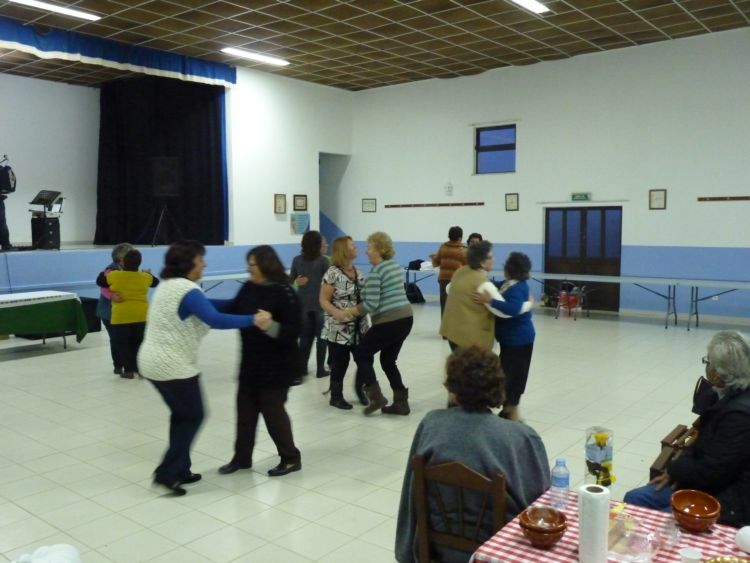 We’ve attended many fairs and festivals in Portugal, however this has to rank as not only the most interesting but the most humbling lesson in social integration and how welcoming a small community can be. The day of the “Feira da Sopa” (Soup Fair) dawned cold, damp and miserable. In fact, it was the sort of bleak February day where you could quite happily stayed at home curled up in front of a roaring log fire with a good book and not travelled miles to visit a soup fair. When we arrived black clouds loomed ominously so you can imagine our relief when we discovered the event was held in what can best be described as the village community centre. Not knowing what to expect we tentatively entered the hall where a throng of people had already gathered and were all talking at once. If you are unfamiliar with the area, Rogil is a typical farming community in the Western Algarve. Families have lived there for generations, and as such, are a very close-knit community. The atmosphere, although welcoming, reminded me of a large family wedding, and us neither guests of the bride or groom. Tables and chairs were neatly arranged round the edge of the room with a large space set aside for dancing. We made ourselves comfortable and “people watched” as we waited patiently along with all the other spectators. The organizers arrived, set up displays, tested the microphone and generally stood around clutching clipboards and looking important (busy). According to the poster advertising the event it started at 15.30 hrs, but of course it didn’t. The trouble is, being typically English we have this fixation about punctuality and we can’t seem to grasp the simple principle that NOTHING in Portugal EVER starts on time. Honestly, you could train your pet dog quicker! Fortunately, the bar did open on time so armed with large plastic cups full of rustic red wine (aka courage) we mingled with the locals trying to discover exactly what was happening, or going to happen. Now in a country where you speak the lingo this is easy, but not when you don’t. I soon realised, as my friends looked at me expectantly, that the boundaries of my pidgin Portuguese just did not extend to the finer points of a “Feira da Sopa”, especially without any previous frame of reference to draw on. The only facts I knew for certain were: there was soup (maybe free), music and dancing. However, it soon became clear as we “mingled” that we were strangers and the only non-Portuguese speaking people in the room. People arrived, carefully carrying large soup pots of various shapes and sizes, and directed to a long table. We watched proceedings with curiosity as each pot had its own dedicated space and a sign describing the soup along with a list of its ingredients. I take numerous photographs, and thanks to my exceptional powers of deduction, I concludethere are two types of soup – Sopa da Terra and Sopa do Mar – I translate these to mean “ Soup of the Land and Soup of the Sea. So far so good, but what did we do? We are still puzzled. We then discovered a stall selling terracotta commemorative soup dishes so keen to support the event we bought one each. Besides, how else would we eat the soup? While mingling and taking photographs my friend fortunately met someone who spoke English and the missing pieces of the puzzle finally came together. 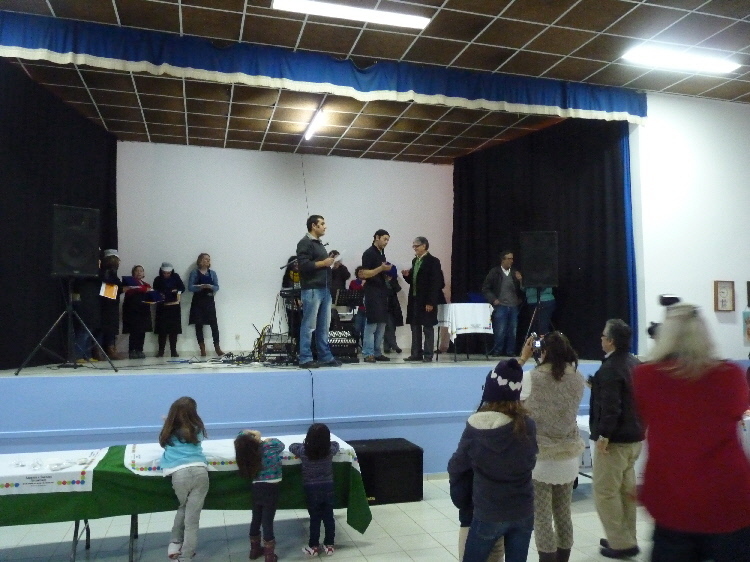 This was Rogil’s first “Feira da Sopa” which is actually a soup competition. Suddenly as the mist of confusion lifted we looked at each other in one of those special “ah hah” moments! 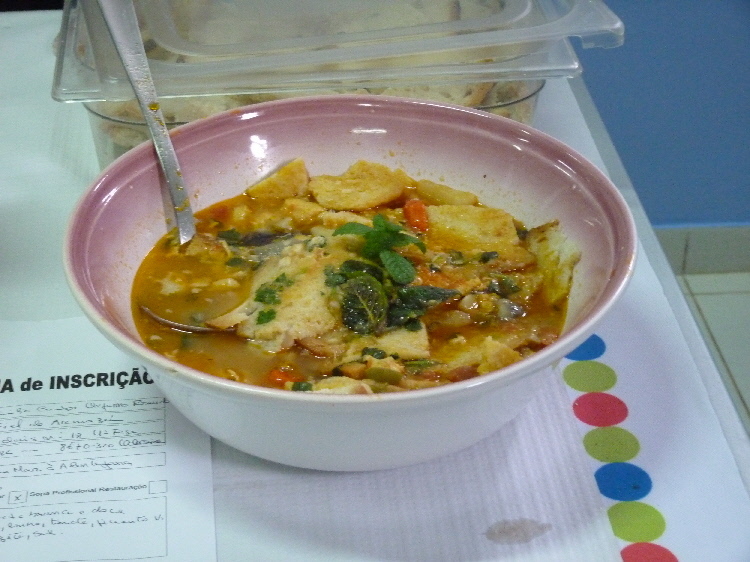 Apparently, each competitor cooks a soup which is assessed by the panel of judges. Once the judging process is complete, the public, that’s us, can try all the different soups free. Now I know why there were so many people standing around with clipboards – they are the judges waiting for all the competitors to arrive with their soup. As the judges tasted the various soups, pulled faces and made notes the competitors looked nervous, and I felt nervous for them. A crackling noise from the microphone, followed by a high pitch whistle of feedback demanded our attention; one of the organisers was on stage and about to make an announcement. As he spoke with joviality his words accentuated by vigorous shoulder shrugging and expressive hand waving, I tried desperately to translate. Our friends looked at me expectantly; almost willing me to understand as if by praying for divine intervention, I would miraculously understand. However, there was no divine intervention, and no miracle. My limited grasp of the Portuguese language left me feeling frustrated and inadequate. Why, despite extensive study, do I seem to have such a mental block with languages? We looked to the other spectators for inspiration. The judging complete, competitors served their soup to eager spectators and like lemmings we willingly joined the nearest queue. 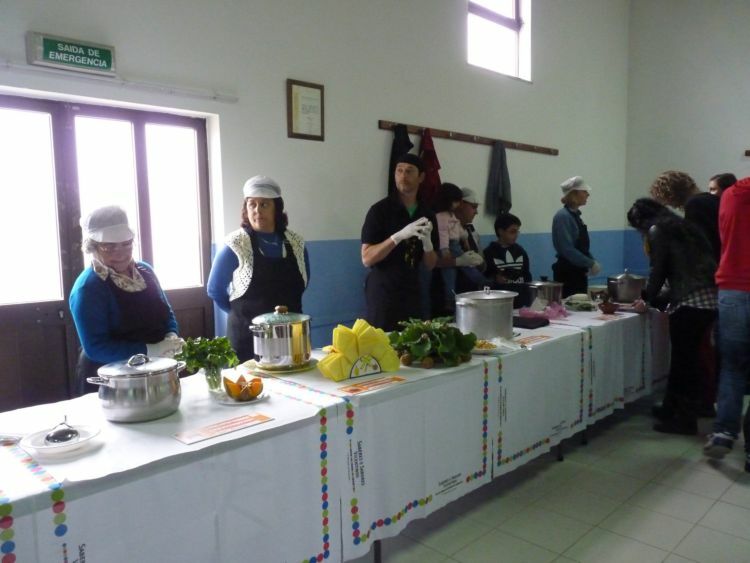 We tasted all the soups including fish, cabbage and a delicious pumpkin and curry soup which we later discovered won first place in the “Sopa da Terra” category. Emboldened by several glasses of “courage”, aka red wine, and several bowls of hearty Portuguese soup I quickly overcame my initial shyness as I attempted to make polite conversation in Portuguese, while I stood in the queue. As the queues dwindled and dancing commenced I noticed all the women sat in groups, while most of the men loitered by the exit from the hall and entrance to the bar. So the women danced together while the men watched. Fascinated, I listened to the accordion player, picked up the beat of the music and studied the feet of the dancers. The dance did not look that difficult I thought, so in a moment’s insanity I pulled my friend on to the dance floor and we shuffled round with four left feet between us. The dance, almost like a galloping two-step with extra steps thrown in here and there for good measure, is harder than it looked. Hoping for inspiration we shadowed other dancers who encouraged and approved of our efforts with a smile and a nod. I don’t know whether my fitness was an issue or the elderly Portuguese women superhuman, but as the last bars of music played I gasped for breath and mopped my sweating brow with a tissue. Suddenly the music stopped, there was a hushed silence and the microphone crackled to life once again. We turned to see what was happening; all the judges were on stage and a hushed silence enveloped the spectators and competitors. Various announcements ensued then enthusiastically received with applause as some competitors were summoned to the stage and presented with a plaque. Ah ha, they are announcing the winners! We thoroughly enjoyed the Feira da Sopa and look forward to discovering more Feiras across the Algarve and Alentajo in the future. However, next time I will take my dictionary and swot up on some relevant vocabulary beforehand. Nothing like hot soup on a cold day – the festival looks like it was great fun! Sometimes the best ‘finds’ are away from the usual tourist areas, so well done. Punctuality is def a trait we need to lose because we know events will not start on time, and if we are waiting for workman Wenesday at 10 can equally mean wednesday in a month’s time. An 10 can equally be at night. What a fun activity. I also want to dance there although I have never danced. Hey Como, please tell me your are joking? You have never danced? Sounds like great fun, PiP! I’d love to run into a soup fair sometime between now and August (fall and winter here). Hi there, I’m not much of a soup person but sounds like it was great fun. A soup with curry sounds interesting and I’m curious about the “sopa do mar” (“mar” is masculine, so it’s “do mar”). I don’t think I’ve ever eaten soup with seafood/fish. Olá Mara…it is sopa do mar 🙂 thanks for pointing out my grammar gremlin 🙂 I was not impressed with fish soup. Although the one I pictured above was the most delicious. It did not win, but it was very nice and I had three helpings 🙂 Especially as fish soup is not something I would cook myself. Wonderful post. Don’t always beat yourself up over the language. Relax, just say the odd word. Never mind if you make a hash of it. My kids hose themselves when I try to speak. But I know I will never go hungry in Portugal. And the Portuguese are generally very tolerant and understanding. 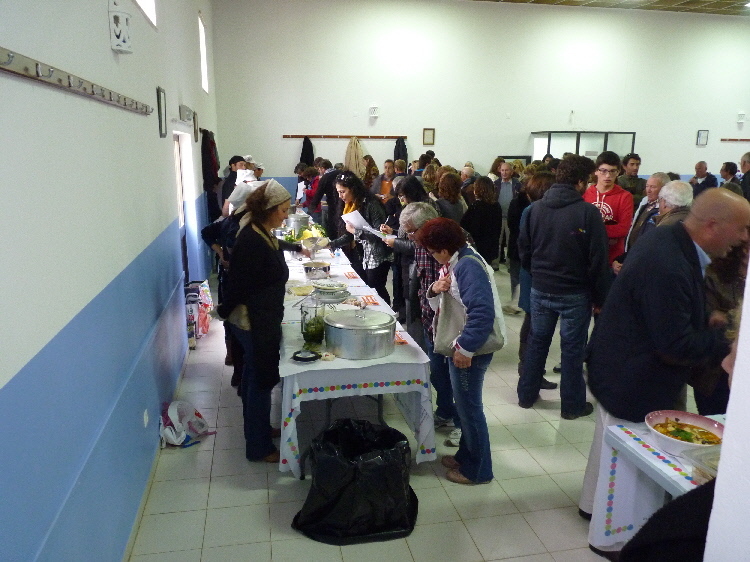 I went to a couple of Soup fairs when I lived in Portugal, always enjoyable and some lovely soups to boot! I love the looks of the “Soupa do Mar” (Fish soup). I’m sure you had lots of fun with the dancing and all even though you didn’t understand a lot of what was going on. At least you made the effort to participate in the community. Sami, the dancing was absolutely hilarious. I felt like a centipede. The music is so fast and jolly I think they could turn a few of these dances in to keep fit routines! I feel for you…i’m going to a fair put on by the German community on Sunday….and my German is limited to Achtung! Minen! which will not get me very far….but I’m not going to miss out on a chance to eat German charcuterie! Hey Helen and welcome. Don’t blame you not missing out on a chance to eat German charcuterie! IT’s seems trange to be in a country yet be surrounded by so many different nationalities here. Are you in UK? This sounds exactly like our local gazpacho feria..down to the old biddies dancing! Hey Chica, I will never, ever, underestimate the old biddies again for stamina. I do Zumba and keep fit, but those ladies…WOW, they never even broke out into a sweat! Maaybe it wasn’t a good one but it is a sort of qcquired taste! We passed through Rogil on our way to Odeceixe so I can picture the scene, Pip. And I’ve been drawn into that kind of festive hot shoe shuffle too. You’re right! What a brilliant description “hot shoe shuffle” and just when you think you have it cracked, they add more steps! I’m really looking forward to discovering other feiras. We were hoping to go to the folar festival on Easter Sunday, but it rained so hard we would have needed a boat. Still there is always next year 🙂 Are you in Portugal? Ok the learning curve may not be easy but you were made welcome and you had a good time, what’s not to love? My Dutch Oma (grandmother) spoke literally one phrase in English (someone taught her to say “how do you do”? but she couldn’t understand the answer) but even in her 80’s she travelled to New Zealand and back several times alone. She said if you wave and point a lot with your hands and keep a permanent smile on your face then people will always try to understand and help out. It never mattered how little she could speak, better she said was the genuineness of the smile and the twinkle in the eye. My advice is that to anyone learning any new language in any new place: if you have only 5 or 50 words, use them all, smile a lot and just show you are making an effort, words will add themselves with time and practice and perfection? don;t worry too much about that. Communication is far far more than grammatical structures and verb endings. Yep, that’s it in a nutshell!! You are right about smiling a lot. Whenever I speak to people, I first apologize for my lack of Portuguese and then smile as I tentively make a sentence. What a wonderful way for me to begin Sunday morning! This is a great story well told: I so agree with the others – do mix as much as possible and do try and your ear will pick up more and more phrases and it WILL begin to be real fun! A smile will always make others notice you! But am laughing about soups: guess what! I’m having gazpacho for lunch: absolutely love it and make it about once a week in the summer months 🙂 ! Together with vichissoise and madrilene and other ice cold soups – never a hot bowl whilst the weather is warm 😀 ! He Eha, it was such a simple but amazing event I am still smiling about it now. Nah…you will never convert me to eating cold soup. It would be like asking for a hot cup of coffee, but then being given a stone cold cup of tea! 🙂 ! 🙂 ! 🙂 ! Pray what is wrong with iced tea . . . in the summer months we live on it ?!!!!! The Food Bank here does something similar . . . you buy the bowl (to raise money for charity) and get the soup for free. So glad you had a good time. That sounds like so much fun! And the perfect day for a bowl(s) of soup 🙂 Finding fairs and festivals here in Thailand is also one of my favorite things to do! We just celebrated Songkran (Thai New Year) yesterday and are in recovery mode now! Hi AD, Yep it certainly was energetic! Hi Kath and welcome 🙂 Have you been to a soup fair yet? No, not yet, but looking forward to it! I’ll look out for a soup festival in our area now I know what they are. Thanks! I loved this post. What an authentic experience. Loved the soup recipe also. Hi Patty, looking froward to next years event!